There aren’t many of us who enjoy shopping for swimwear, it’s right up there with jeans when it comes to the most difficult item to shop for and it certainly tops the list for the most hated item to source, but it doesn’t have to be this way. There are SO many different style options available these days which means there is something to suit every style preference, size and shape. You just need to know what to look for and where to find it. And that is exactly what I’m going to help you with in this 5-part mini-series. When I was hashing out this series it occurred to me that most of us shop for swimwear with our body issues in mind rather than our body shape, so rather than suggesting styles for different body shapes I’m going to be focusing on some of the most common body issues. I’ll be looking at swimwear for women who are top heavy and want support, women who carry weight around their middle and want coverage, women who are bottom heavy and want to minimize their bottom half, and women who are small on the top half and want to maximize their small bust. The first 4 episodes will contain a few tips on what to look for and why, along with a selection of my favorite options available to you now, and in the final episode I’ll some share extra tips for ultimate poolside confidence. 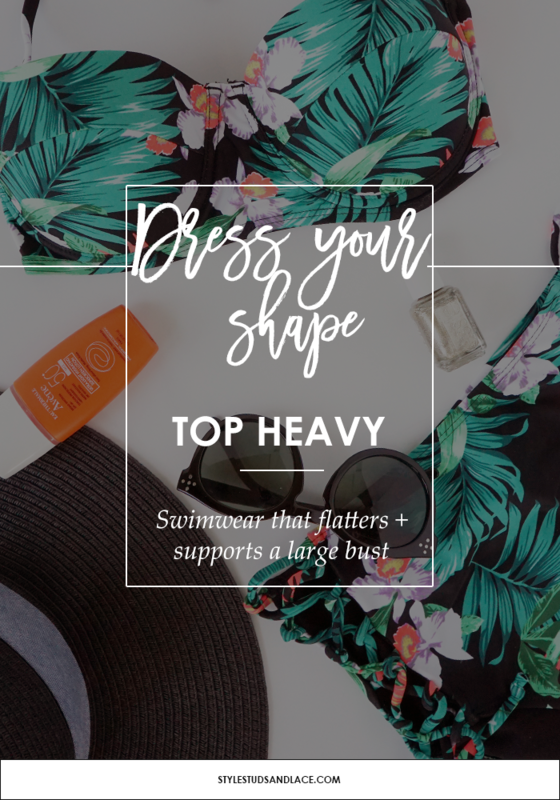 If you’re top heavy you’re probably looking for your swimwear to do one or all of the following – offer support, minimize your bust and narrow your torso. Cup sized swimwear – Whether you’re wanting separates or a one-piece, the number one thing to look for is cup-sized swimwear. This is the best way to ensure not only a great fit but the best support possible. Many lingerie brands have swimwear collections (Freya, Fantasie and Panache are some great options) and sites such as Figleaves, ASOS and Rigby and Peller have a fantastic selection of swimwear for larger cup sizes. Pay attention to the color and pattern. Color blocking is a great way to minimize the appearance of a large bust. The gold band across the top of this bikini top is a great example of that. Two tone swimwear is a fantastic way to draw attention away from your bust. This colour block suit and star print bikini do this so well. Choose swimwear with a low neckline as this will narrow your torso and flatter your bust…and don’t rule out a deep plunge for fear that it won’t offer you support. Yes there are some skimpy and supportive plunging styles around, but there are also some like this swimsuit that offer a variety of larger cup-sizes. 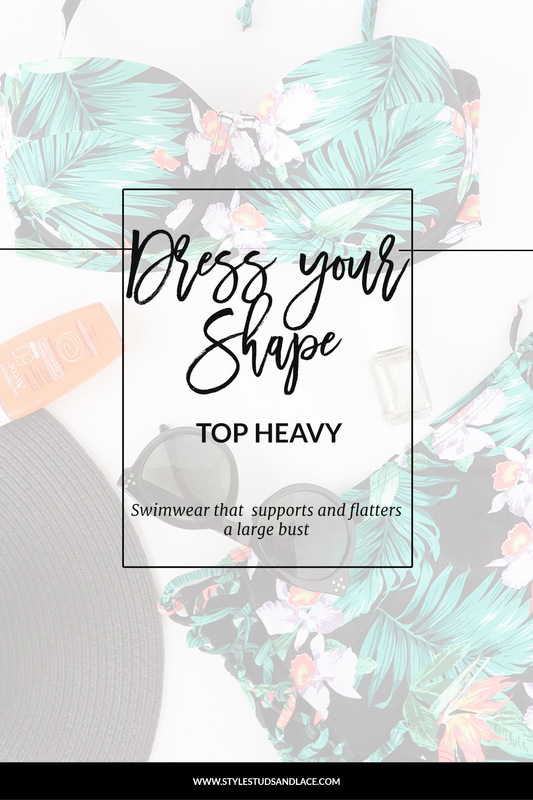 I know that a higher neckline will give you more support, but they will also make you look heavier…and as I’m trying to help you find swimwear that not only fits and supports, but that flatters as well, I’m going to suggest that you give high necklines a miss. But, if you are dead set on a wearing a higher neckline then consider something with sheer panels like this. Steer clear of little triangle bikini tops that offer next to no support. There are some strapless options that claim to stay put, but I would be surprised if they stay put after swimming, so I suggest you give these a miss. ONE – This swimsuit has a low neckline, great support, and color blocking thrown in for good measure. It’s an all round great choice! TWO – This bikini also uses colour blocking to great effect and the bikini top comes in a range of cup-sizes from C – I! THREE – This bikini offers a decent amount of support thanks to the two tie details and the band that runs below the cups, and the high waist bikini bottoms will do a great job of balancing out your top half. FIVE – This swimsuit has an integrated balcony bra (sizes C – G) for fantastic support, and the fabric offers a little shaping for added confidence. SIX – This gingham set is so pretty and bang on trend. The high waist will highlight your waist and the bikini top will offer you support. SEVEN – This bikini is using color blocking to it’s advantage – the white panels at the side of the bikini bottoms will narrow your hips and the white blocks on the top will minimize your bust. EIGHT – If you want a high waist set for added support then opt for something like this. The sheer panel will help to eliminate the chance of you looking heavier.